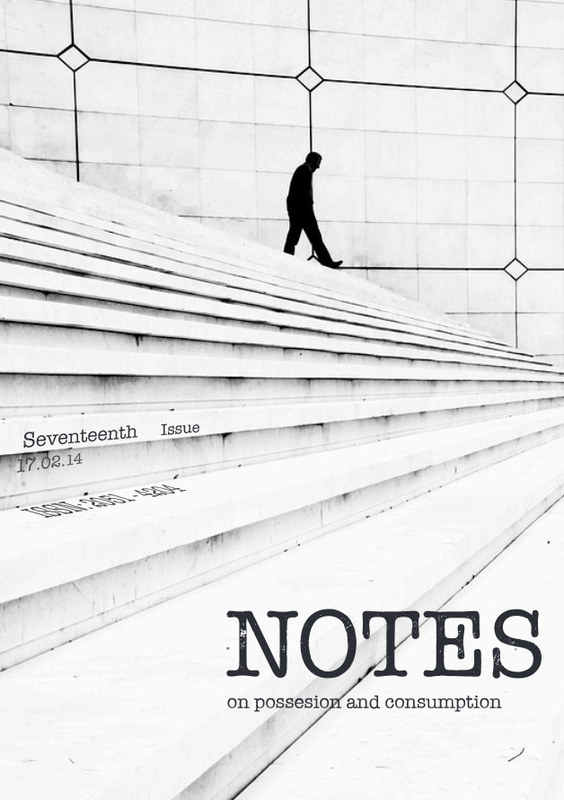 The seventeenth issue of Notes, out now, is loosely themed around possession and consumption. Many forms of possession are featured, beginning with Arthur Hirsch’s haunting tale of metaphysical possession. This neatly contrasts with Domhnall McDonald’s depiction of a traditional Scottish community – his short story explores a more politically tangible possessiveness. Possession and possessiveness are primal instincts which manifest themselves in a myriad of subverted ways in our highly ordered lives – which we hope is reflected in the range of pieces in this issue. The centrefold is a set of drawings collected by Lizzie Perkins, who asked strangers and acquaintances to each draw a cup of tea. These simple images are telling of our desire to possess and consume: the drawings are strangely appealing and filled with symbols of warmth and homeliness. Sarah Sheard in Noli Me Tangere explores a more troubled relationship with drink and Greg Forrest loosely extends the discussion to food in ‘Fruit Bowl’. We hope this issue provides inspiration for further works and future issues. As the penultimate issue of the academic year, this is the last opportunity to see the cycle of inspiration and creation which occurs between issues. We look forward to hearing your thoughts, and hope that we will see those of you in Cambridge at the Notes exhibition, featuring the work of Ayesha Singh (page 30) and many past contributors.